What to Do in Bad Economy - Go Back to School! I think the only segments of the economy that are booming right now are sales of Ramen, and the field of Education. Our family's gainful employment index has now whittled down to a big fat zero. So what are we doing? Hubby is going back to school. To be fair, he has been going to college part time at night for the past few years. Since he joined me in the ranks of the unemployed victims of the economy last week, it made the most sense for him to primarily focus on finishing his degree full time. Jin takes most of his classes online at Strayer. My plan is to (finally) get a job and support the family, while Jin finishes school and watches the kids after their school day is out. Did I mention that I just applied for a job in Demoine, Iowa? Nothing is off the table at this point. Online school can be done anywhere, so we are able to relocate if need be. I have been checking out one of the best online MBA programs at The University of Scranton. This is an all online, full accredited MBA program. It's even rated among the top 15 by The Princeton Review. I have four MBA courses under my belt, from the U of R Simon School so I might even have a head start. Giant Shark, Humboldt Squid - signs of El Nino? Expected El Niño impacts during July-September 2009 include enhanced precipitation over the central and west-central Pacific Ocean, along with the continuation of drier than average conditions over Indonesia. Temperature and precipitation impacts over the United States are typically weak during the Northern Hemisphere Summer and early Fall, and generally strengthen during the late Fall and Winter. Recently I have read a few strange headlines of abberant behavior in sea animals. A huge shark washed up dead on the shore of Long Island, and today I read about giant toothy humbold squids that are scaring scuba divers and beachgoers around San Diego. I wonder if the strange animals floating around have anything to do with El Nino? It kind of makes me want to get a digital camcorders and go down to the beach and see what I can see. Although Humboldt Squid are generally found in the warm Pacific waters off of the Mexican coast, recent years have shown an increase in northern migration. The large 1997-98 El Niño event triggered the first sightings of Humboldt Squid in Monterey Bay. Then, during the minor El Niño event of 2002, Humboldt Squid returned to Monterey Bay in higher numbers and have been seen there year-round since then. Similar trends have been shown off the coasts of Washington, Oregon, and even Alaska, although there are no year-round Humboldt Squid populations in these locations. It has been suggested that this change in migration is due to warming waters during El Niño events, but other factors, such as a decrease in upper trophic level predators that would compete with Humboldt Squid for food, could be impacting the migration shift as well. Put down the Christian videos and get a load of these interesting web sites. 2. http://www.americanchronicle.com/articles/view/94878 An Entire article dedicated to the meaning of life that is the number 42. Why is the Republican Party Acting Anti-Science? Previously I wrote about Bobby Jindal's rebuttal to Obama' saddress to Congress, and how Bobby Jindal is Anti-Science. There seems to be a pattern emerging, as this article in the Daily Kos enumerates. Coupled with Bobby Jindal's mocking of volcano monitoring, Sarah Palin's mocking of fruit fly research and Bush's putting stem cell research 8 years back with his policy, this is leading me to think that the party of Lincoln has been taken over by neo-luddites who just snicker and laugh at things they don't understand. No wonder so many moderate Republicans supported (and continue to support) Barack Obama - the rest of the party has veered so far to the far right that they have appalled even the fiscal and moderate social conservatives that should be their core support. Do people not realize that technological innovations are born out of scientific research? And that technological innovations are the best strong future we have to bank on to improve quality of life for the population of this planet. And that to remain competitive in a global market America needs to be first and best in science and technology? Well, if Rush Limbaugh is indeed the leader of the Republican party I sincerely hope that the American people can smell that bullsh*t a mile away. Rush is the nastiest human I have even had the displeasure of listening to, and his manipulative anger stirring mocking hyperbole calls to the lowest of the low in human nature. I beleive in free speech, and support Rush's right to speak. But please, people, see it for what it is. Hate. Pure Hate. What life lessons can we take from the asteroid the size of a 10 story building that whizzed past Earth this Monday, completely surprising astronomers who are supposed to be watching for these events? Space.com reports that the asteroid Asteroid 2009 DD45 "flew past the Earth at roughly twice the distance of the highest Earth-orbiting satellites." Monday at about 8:30 AM when you were getting ready for your day, this near miss occurred about 45,000 miles above the Earth. Astronomers say if this had hit the Earth it could have been a city destroyer as it was about the same size as the asteroid that hit Siberia in 1908 which flattened 80 million trees in an 800 square mile area. Back to the life lesson - its pretty clear there are 2 life lessons here. 1. The Space Program and NASA are in fact important and should be funded as much as practical. Asteroids should be monitored and not surprise us this way. We need to investigate a method for pushing these off course if we find they are heading towards Earth. 2. The real life lesson - Easy - live for the moment. Two of the things Republican Governor of Louisiana mocked from Obama's address to Congress (and the Nation) last night were scientific spending in the stimulus plan. As an educated American I understand clearly that to compete in the global economy and innovate new ways to create and use energy we need to promote scientific ventures. Not only simply creating jobs, these projects help us understand the world and make it a better place. 1. MagLev Trains. Jindal mocked this saying the stimulus plan will pay for a Levitating train from Las Vegas to Disneyland. First of all, MagLev trains are cutting edge mass transportation, and mass transportation helps us to stop relying on foreign oil. Second of all, tourism (i.e. Disneyland and Las Vegas) is a huge economic sector. People from all over the world are travelling to these spots and spending money. And tourism employs people in good jobs. 2. Studying volcanoes. This just boggles my mind that anyone would think that studying the volcanic activity in our Earth is a waste of money. Besides creating jobs, lets look at some simple facts, that are a number of active volcanoes in the United States right now. Including Mt. Redoubt, the Alaska volcano you can follow on Twitter. Anyway I wonder if he thinks studying Hurricanes is as wasteful as studying Volcanos? Katrina much, Mr. Governor of Louisiana? Well, I guess the creationalist Jindal has a history of Anti-Science. This article in the Agonist is good: Bobby Jindal Science Fail. Oh, and by the way, Mr. Obama - the first automobile was invented by Germany's Karl Benz. America and Henry Ford invented the assembly line, and perfected the automobile. I came across a wonderful essay written by Ray Bradbury for National Geographic Magazine. Entitled, My Mars, it is both an explanation of how he came to write the Martian Chronicles, and an homage to the red planet that inspired his writing. Coming right around the 5th anniversary of the Mars Rovers, this article is very timely and topical, but also I really like the way Ray makes it personal, giving us a little glimpse inside the head of the kid who fell in love with the dream of visiting Mars. While I snack on Buffalo Chicken Dip, and my kids color New Years Eve themed coloring pages, I decided to write about the year in review. Here are some conclusions. 1. T-Shirt sales are a fickle dream. 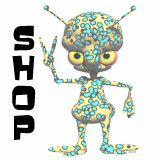 Although Sci Fi T-Shirt is my top keyword, I have yet to sell a single shirt since I started this operation in April. Hmm... Well, optimism reigns supreme. When the last startfighter 2 comes out maybe I will sell a Last Starfighter T-Shirt. 2. i09 has a great 2008 Sci Fi Year in Review feature. 3. Too many great names in Sci Fi passed away this year. I guess I must be getting old because I find myself really carding when celebrities die. Oy Vey! Well, here's to the hope we all live long happy prosperous lives starting right now. Eartha Kit, of Catwoman fame, died Thursday at the age of 81. She was being treated for colon cancer. The beautiful and talented singer, dancer, and actress was famous for singing the song Santa Baby, and she died on Christmas. I hope that she was able to be with her family before she passed. I have a suggestion for you - if you are over 40 and have not yet had a colonoscopy talk to your doctor about scheduling one. They are a painless procedure (with a slight unpleasant prep) that can save lives. By catching colon polyps at a small size you can have them removed and avoid having them turn into cancer later. Colon cancer is one of the most preventable cancers. I realize this is not a topic most Sci Fi blogs would talk about but it is a subject dear to my heart. I have Crohn's disease, which can increase your risk of colon cancer. My maternal grandmother died from color cancer. I have had three colonoscopies so far and I am sure I have a lot more in my future. If I can do it so can you. Same thing we do everyday Pinky, TAKE OVER THE WORLD! So here's today's random update from me. I have officially become a statistic of the recession of 2008 - after 10 years at the "day job" I was laid off on Tuesday. So if you'all have any job leads for an Email Administrator (Notes or Exchange), pop me a line. marianne DOT case AT comcast DOT net. My LinkedIn profile is http://www.linkedin.com/in/mariannecase if you want to add me to your network. You will not see my lack of work holding me back. I have some major plans for my job search, and in between that I plan to do a lot of Sci Fi Jungle blogging. Keep tuned for a "Top 10 Holiday Gifts for the SciFi Fan" list coming soon.